Zaun’s Hockey fencing system has been specifically developed to overcome the common problems with traditional wooden hockey boards, which are expensive, regularly require replacements and create a lot of noise during play. 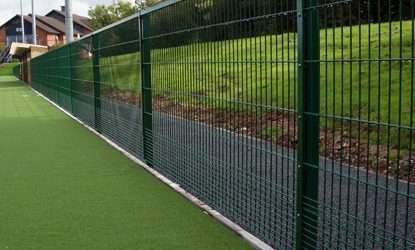 This hockey fencing system uses twin wire 8 mm horizontal wires in a close 25 mm x 50 mm open mesh pattern to clad the lowest 200 mm part of the hockey pitch fencing, or up to 400 mm behind the goals where there is an increase in cannonball-like impact. Both of these fences are then topped with Super Rebound mesh. This unique hockey fencing system can be manufactured in a single panel with fence heights of up to 6 metres, ensuring there are no fence breaks for players to catch fingers or potentially injure themselves. This results in an extremely robust section of the hockey fencing that is able to withstand the cannonball-like impacts that occur during a game of hockey. However for pitches that endures heavy use, the fencing body panel is available in a 50 mm x 100 mm pattern to create a strong panel in which the vertical wires are extremely resistant to impacts. Measured under the same conditions the noise from ball impact on traditional hockey boards was 97dB, while Zaun Hockey fencing produced a noise of only 68dB. Fixings every 200 mm and synthetic rubber inserts at each fixing virtually eliminate rattle during play. A clamp bar covering the panel ends ensures a safe playing surface with no sharp edges. To maximise your return on investment, Zaun’s Hockey fencing system is ideal for use on hockey pitches that may also be used for other sports such as tennis, football, netball or basketball to create a MUGA that is suitable for all sports. Samples of Zaun Hockey Fencing are available upon request, to request your free sample please click here. Note: For pitches that receive heavy use the body panel are available in a 100x50mm pattern, this creates a strong panel in which the vertical wires are extremely resistant to impacts. We also recommend increasing the hockey rebound section behind the height along with combining our Super Rebound effect into the system to limit damage caused by ball impacts.